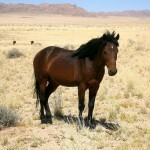 Namib Desert Horse is a breed of rare wild horses native to the barren Garub plains of the Namib Desert in Africa. Its dark-colored coat along with its athletic appearance is similar to that of the European riding horses. 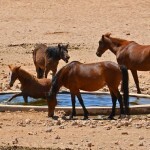 The herd of feral horses is very hardy, living in the harsh environment of the desert. 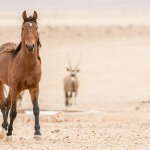 The Namib horse population has been carefully studied in order to gain insight into their behavior and the physiological mechanisms they have developed to survive in an arid land. Despite years of intensive research, the origin of the Namibs is shrouded in mystery. 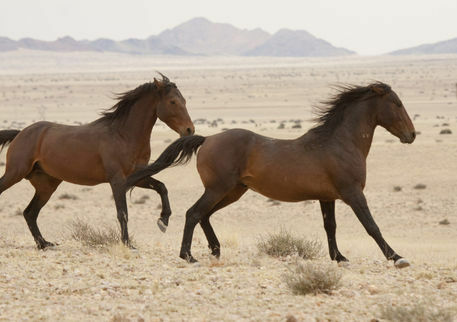 The ancestry of these horses has been referred to by several theories. One of the theories relates to Thoroughbred horses, which were being transported on a cargo ship to Australia. 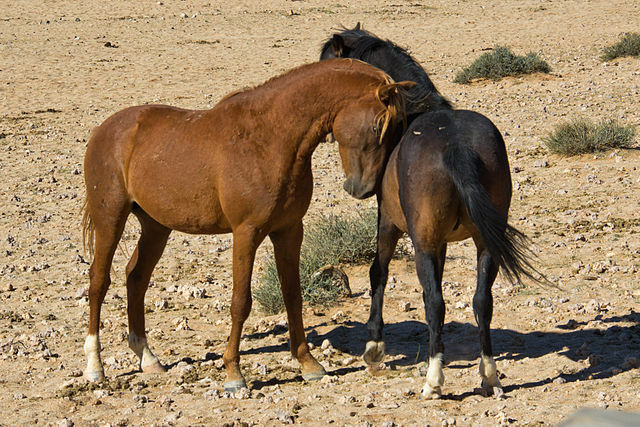 However, the ship was wrecked close to the Orange River, and few of the horses managed to swim ashore traveling to the Garub region near Aus in Namibia. 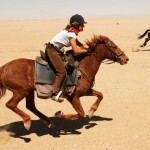 Another theory says that they have the Cape horse and Basuto pony crosses as their bloodlines, which were ridden by the Khoikhoi people traveling to the north of the Orange River. One of the most plausible theories is that they have descended from a group of escaped horses belonging to the German Schutztruppe as well as the South African troops. These horses were mainly used in military campaigns during the First World War. It is also likely that the Namibs originated from some of the horses that were bred by Baron von Wolf at his Dunwisib Castle. During the First World War, Baron was killed in Europe and his breeding station was abandoned leaving a herd of 300 freely-roaming horses around Dunwisib. 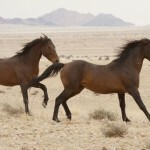 A study conducted in 2005 suggests that these desert horses may have come from a combination of breeding stock of European-origin and escaped cavalry horses. The breeding stock probably came from a stud near Kubub, rented in 1911 by Emil Kreplin. 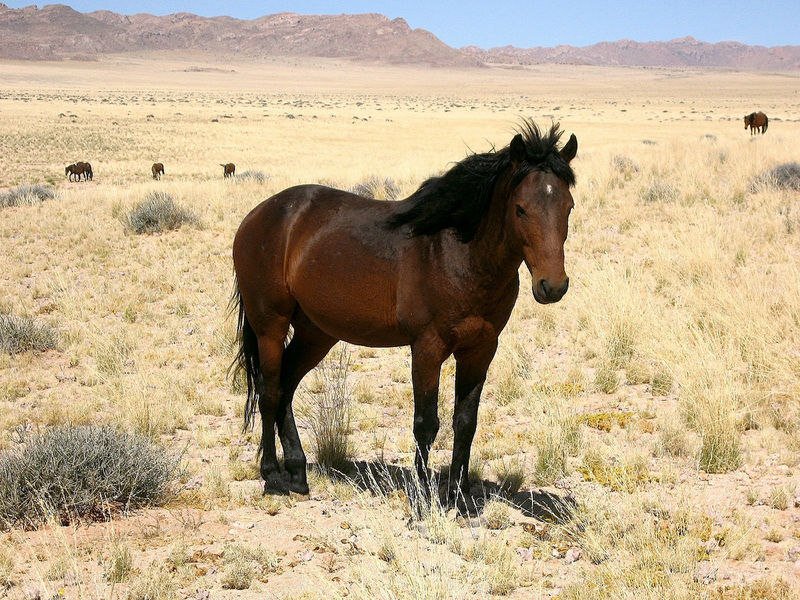 Initially, the horses had to compete for forage as domesticated livestock were released onto the same area where the Namibs grazed. Their numbers reduced significantly during the 1970s due to food scarcity. 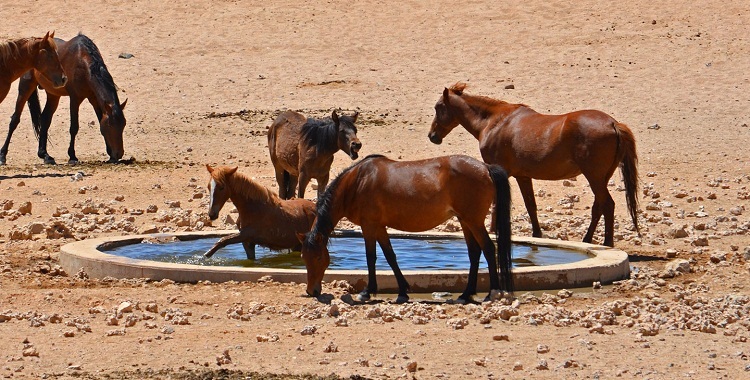 Jan Coetzer, an employee of CDM (Consolidated Diamond Mine) working in Sperrgebiet, took an interest in the horses’ welfare and made special arrangements to provide water to the Namibs. He also collected funds from the CDM to install water tanks in the Garub plains. 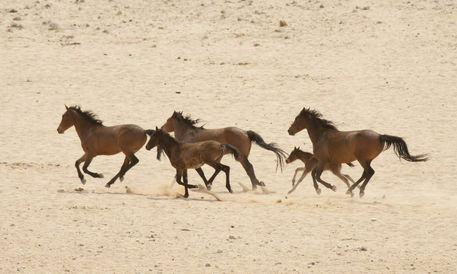 In 1984, the horse population was estimated at 168 animals. 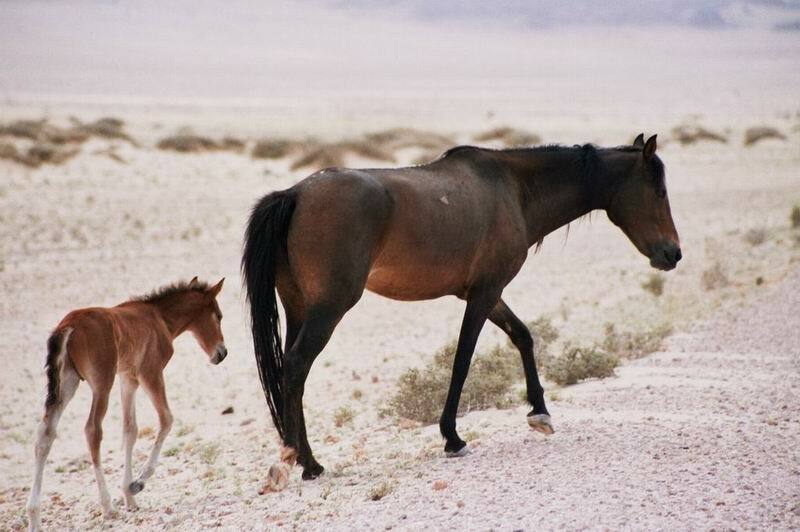 During the mid-1980s, the habitat of the Namib horses was included in the Namib-Naukluft Park. 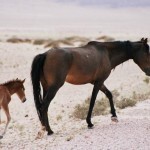 In 1986, it was decided that all the horses would be removed, but strong public opposition forced the authorities to remove a few horses with 10 intended for research purposes while 8 others were used for patrolling the Etosha National Park. When Namibia became independent in 1992, southern Africa was hit by a drought. 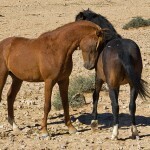 That year more than a 100 horses were captured and sold, most of which failed to adjust to the new habitat and died. Several attempts were made to kill the entire herd as it was considered a threat to the Oryx population. 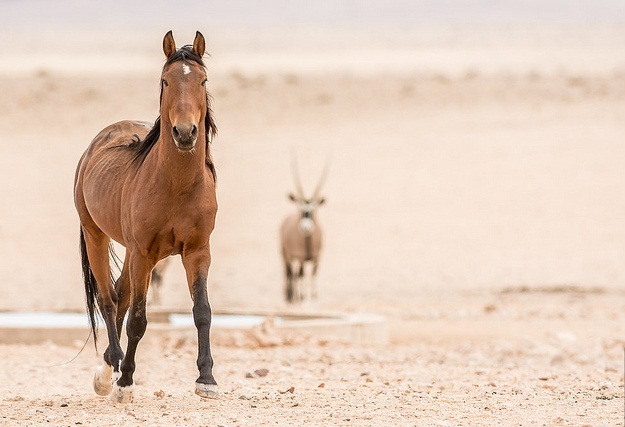 However, the Directorate of Nature Conservation of South West Africa and Namibia now operates to keep the Namibs horses safe. 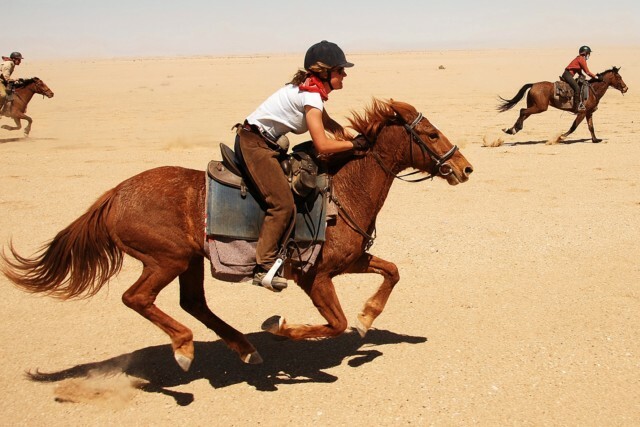 Namib horses have an extensive home range as they travel 15-20 km in order to search for water, food, and shelter. 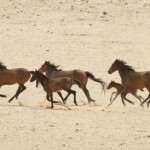 Several studies have revealed that these horses live in 6-11 groups, including a combination of breeding groups, stallion groups sharing the breeding duties, and a herd of juvenile bachelor horses. During water scarcity, they can go without having water for 30 hours in the summer while it can be as long as 72 hours in the winter.